Scooper - Technology News: What explains the sharp rise in incomes of the wealthiest 1%? What explains the sharp rise in incomes of the wealthiest 1%? A purely technological explanation cannot explain all of the variance in the change in top incomes across rich countries. 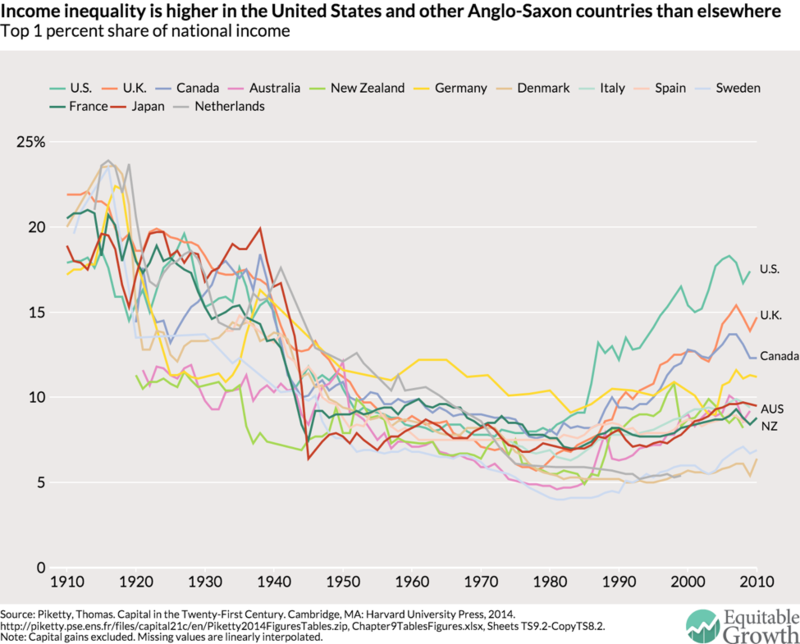 Figure 1 shows the share of national income accruing to the top 1 percent of earners (excluding capital gains) over time for a selection of highly developed countries, from Thomas Piketty’s Capital in the Twenty-First Century . The chart provides a history lesson in its own right. You can see the sky-high inequality of the early 1900s, the remarkable collapse in top incomes following World War II, and the long moderation of income inequality during a period of high growth in the succeeding three decades. After that, we can see the recent explosion in top-end inequality starting during the mid-1980s. Notably, the pace of growth in that inequality is strikingly different among developed countries. Anglo-Saxon countries, such as the United States, the United Kingdom, and Canada, saw their rich run away from the rest of their populations. In the United States, the top 1 percent of earners went from claiming 8 percent of national income in 1980 to nearly 18 percent of national income in 2010. The United Kingdom saw a similar increase over the same time period (from 6 percent to 15 percent), as did Canada (from 8 percent to 12 percent). Given this new understanding of top-end incomes, can we point to some additional explanations? While some countries do have some technological advantages over others, all advanced Western economies are broadly on the same level in terms of development. Modern information technology is pervasive in all major sectors of the economy, and they all have high-performing education systems. So why is similar tech driving dissimilar returns to skill across the developed world? Are the United States and the United Kingdom exceptional in how talented their high performers are? Or is it a matter of institutional disparities between countries—that is, the degrees to which collective bargaining, high marginal income tax rates, and intellectual property regimes rein in the bargaining power of the top 1 percent? These are still open questions, and it’s beyond the scope of this blog post to give a full answer. Suffice it to say, although inequality is increasing in many rich countries, the severity to which it’s increasing varies dramatically depending on where you look.